Never count your money, while you’re sittin’ at the table. There’ll be time enough for countin’ when the dealin’s done. Unfortunately for the Unified School Board, they heeded none of these rules, and found themselves ensnared in what Admiral Ackbar from the Star Wars series classically observed: Its a trap. It all started when the County Commission asked the Unified School Board to get them some preliminary budget numbers ostensibly, to help the Commissioners better understand the overall cost of the merged system, and then be better prepared for the impending tax hike that was coming no matter what. What no one on the USB seemed to recognize is that this move put them in a position to be the scapegoat for these very tax hikes. Add to that, a vote for an additional $145m and you’ve got yourself a recipe for a massive blame shift, which is exactly what is happening. In an article published Thursday in the Commercial Appeal several local officials expressed disdain over the addition of $145m to the schools budget. This political football is our future. Even the editorial page of the Commercial Appeal got into the act, erroneously asserting that the district asked the County Commission for $145m more. That’s not exactly the case. They made the top line of their budget $145m more. Its an important distinction that I’ll cover in more detail below. Since the first talk of Charter Surrender, there has been a narrative that a merged system would somehow a) degrade the educational quality of County schools, and b) be more expensive. There are a whole lot of reasons to believe that neither of these situations are coming to fruition, but its hard to make a case for it, since the USB hasn’t released anything on paper…from revenue projections to where the money will go. 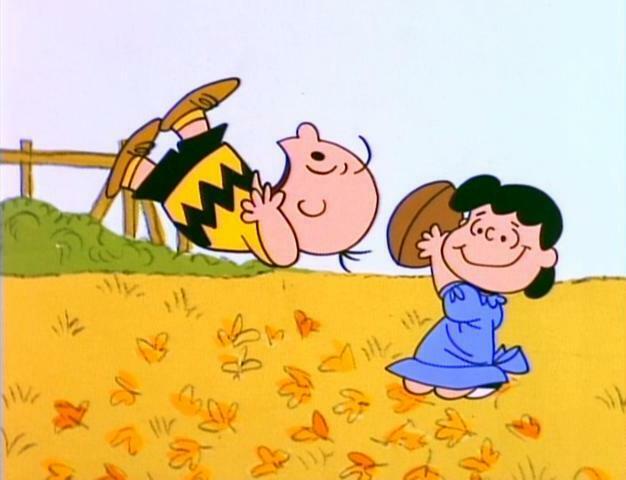 All we have is a $1.3b football with the County Commission playing the role of Lucy, and the USB the hapless Charlie Brown. School budgets are complicated. Schools are expensive. The budget for public schools (both systems combined) this year is over $1.5b for all revenue. Schools get two kinds of money, “General Revenue” which goes directly to education and is primarily paid for by local and state government, and “Special Revenue” which must to go to specific things like School lunches or Special Education (just to name a few). All revenue is the combination of these two classes of revenue. The County Commission currently funds less than 24% of the school’s budget. Its important to note where the money comes from. Not all that money comes from the County. In fact, the amount budgeted by the County Commission for schools last year made up just 23.2% of the revenue for both systems combined. 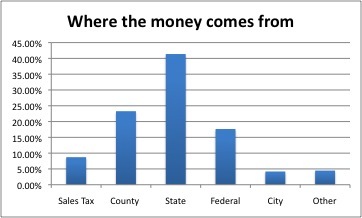 County Sales Tax also comes into the funding mix. The percentage of sales tax collections that go to the schools is mandated in State law. Last year, total County Contributions ($361m budgeted and $140m from sales tax) made up 32% of all revenue for the two districts. The State makes up 41.2% of all revenue for both districts. The Federal government kicks in another 17.6%, the majority of which goes to programs for low income and special needs students. Add all that together, and we’re at about 91% of the $1.5b budget. The final two lines are City of Memphis (4.2% of both budgets) and “Other” which makes up about 4.5%. The state funds school districts using a formula call the Basic Education Program (BEP). This formula not only determines state funding, but also the minimum amount County government must fund. 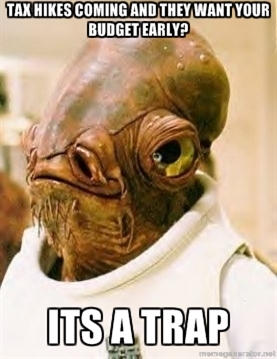 According to the TN State Board of Education, BEP for the 2014 school year will not be released until April. This means that the County Commission will have no idea how much money its on the hook for until April, no matter what the USB decides on now. But there’s more. According to the MCS Budget office, the $1.3b number being tossed around is for “All Revenue”. This is an important factor to understand. If that’s the case, the budget for County Schools is $200m less than last year. But even if its not the case, taking the per pupil expenditure from last year ($8500) and multiplying it by the number of children anticipated to be in County funded schools or Charters (145,060) gets you to $1.23b, which makes the $70m difference seem a lot less severe. But this isn’t about schools. Schools are the single biggest expenditure for local government. This makes them the easiest target to blame for anything and everything. The School Board just happened to make it easier with the $145m vote the day before. In reality, the Commissioners are looking for someone else to blame for the impending increase of the property tax rate. An increase that has been inevitable from the start. The County Commission asked the USB to provide budget numbers earlier than in previous years because there is a very good chance property tax collections for next year will decline. This is due to a drop in property values from the overheated levels that we saw just before the collapse of the real estate market in 2008. Every four years the Assessor’s office does a new assessment on every property in Shelby Co. This assessment determines a budgeting function called “the value of a penny”. In essence, the value of a penny describes the revenue collected from 1 penny of property taxes. Take that value and multiply it by our County Tax rate, and voila, that’s how much revenue you can expect to garner from property taxes. Since housing valuations have declined generally, the value of a penny should also decline, making it necessary for the County to increase the property tax rate. That doesn’t mean your property tax bill will increase. In fact, it will likely stay the same. The rate will just be increased to maintain current revenue. The long hard fact is, even though property tax collections will be down, the cost of our debt load (13.7% of budget), the Sheriff’s Department (13.1% of budget) and other departments hasn’t decreased one bit (it should be noted that Education makes up 30.5% of all budgeted County expenditures at $361m). First of all, what the County Commission has asked the USB to do is patently unfair and most likely politically motivated. Asking the USB to come up with a budget proposal, six weeks before the state is scheduled to release BEP means that revenue from the state is currently unknown, as is the minimum funding requirement for the County government. Nothing new has been learned here. All we’ve achieved is a number to place a political target on. Secondly, there is no document that I’m aware of that breaks down how much of this $1.3b budget would come from which source. When I asked an official at the MCS budget office if they had such a document, they said they did not right now. The USB would do themselves some good to release such a document, or better yet, a google spreadsheet that updates as they make changes to line items. Third, its telling that members of our County government know so little about the past budgets of the school districts as to be confused about a potential $200m decrease. Knee jerk reactions don’t serve the community well. That seems to be what we’ve been getting from this Commission for some time on all kinds of issues. Finally, the assertion that this budget is some pie in the sky “wish list” both ignores the real cuts the USB has made in the budget and serves no purpose other than to give officials a false soap box upon which they seek to say “I told ya so” even though they have no basis in fact to do so. It seems the very people who have been crying “politics” throughout this entire process are the ones engaging in them the most. What’s both surprising and disconcerting is that they have now been joined by people who supported the merger…apparently accepting the opposition’s talking points hook, line and sinker. Its disappointing, though not terribly surprising that this is the nature of the conversation in our community about something so vital as public education. While the public certainly deserves a robust and detailed discussion about the future of education in Shelby Co., the tactics employed by the County Commission do nothing to raise the level of discourse. If anything, if brings it further down to a base level of misunderstanding and petty political rhetoric. Shelby Co. deserves and needs a public educational system that is equipped to play a positive role in a reversal of fortune for the 30.3% of children in our community that currently live in poverty (Source). There’s no way to know if the new system will be able to overcome the challenges of generational poverty and low educational attainment, but if those were our goals, rather than blame-storming for political gain, we would be one step closer to achieving it. But as long as our elected officials choose to play politics with public education…from the State Legislature to local government, we’ll be fighting the wrong fight…and the children will suffer for it. As for the $200m reduction in budget, it is my hope that the USB will publish revenue projections based on the General and Special Revenue funds so that local leaders might better educate themselves on the issue rather than engage in knee jerk reactions that ultimately ill serve the public. Hopefully, our elected officials will also choose to educate themselves once that information is available. What we need now, more than anything else is clarity to cut through the base assumptions that have been foisted on the public discourse…that and a decision by our elected officials to stop acting reflexively, and start acting responsibly. “@vibinc: How the County Commission played the School Board for the fool – http://t.co/TZE2dXLl – #MCS <~THIS!!! @vibinc I see this as Mike Ritz using the USD to punish the muni’s and scare muni’s away from starting their own dist. Thanks for a very informative article. I’ve also been wishing the USB would be more specific in their budgetary info. A spreadsheet would be wonderful. We were spending X dollars on the county system and X dollars for the city system. If you combine those dollars and don’t make other changes to the system, why is it so out of balance? Can’t they get back to equilibrium, then tell us how much is needed for delayed maintenance, system enhancements, etc.? I really want the unified system to work and hate to see its critics given more ammunition.